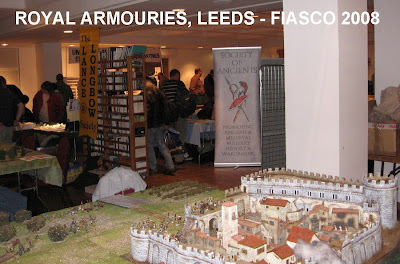 Fiasco 2008 The second part of this busy weekend was a trip up to Leeds for the ever popular Fiasco at the Royal Armouries. 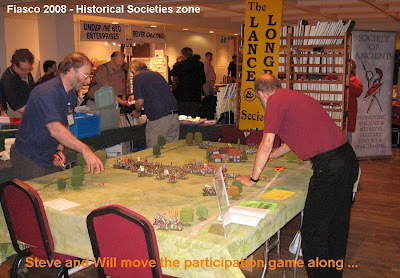 In the preceding days it had become clear that the organisers had not got my penultimate email and although we could be fitted in, there was no space booked or available for our game. Disappointed, we buddied up with the Lance and Longbow Society (/DL Books) .. a sort of return compliment to Partizan (where SoA and LandLSoc buddy up and we do the game ...)... Nice show. Great venue, of course ... and quite a variety of games on display - different ones to the southern shows circuit too. Most were the rather predictable '28mm statics' of course, although the Pudsey organiser was there with a participation game taster for the HOTT competition they run at the other Leeds show in December. 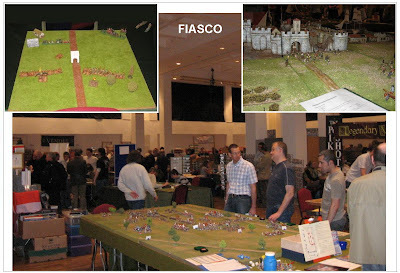 The '28mm statics', of course, often look stupendous but it can be hard to see if they would make good games because there insufficient (if any, sometimes) game turns played by which to judge. Mind you, don't be misled by my photos - the show was very busy in the morning, and it wasn't until the characteristic early afternoon 'wind down' (often surprisingly early at these northern shows) that I was able to get round, pick up a few bits from the traders and take some pictures. Thanks to everyone at Fiasco (and thanks for helping us get the kit in and out so efficiently). If you didn't make it this year, come along and see us at the armouries next year (maybe even volunteer to help put on a game ...). Next SoA outing for this venue should be a round of the Doubles Masters in July - then, emails all being delivered, we hope to be back for the last weekend in October. 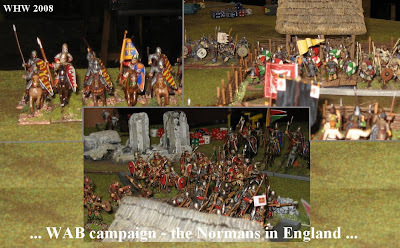 There were two main themes to the WAB 'competition' going on ... the Punic Wars and the Normans in Britain, in addition to which there was some playtesting/sampling going on of the siege game variant. I say competition, but I must say the impression I got was that the competitive element was little more than a device to get people involved in a series of related games around the theme. That said, it looked like there were plenty of prizes being given away. 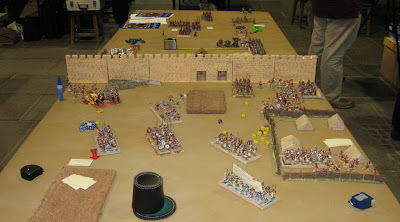 I then noticed, over in the back corner, Rick Priestley and friends engaged over another group of tables playing Warmaster Ancients and got myself coached through another few turns. 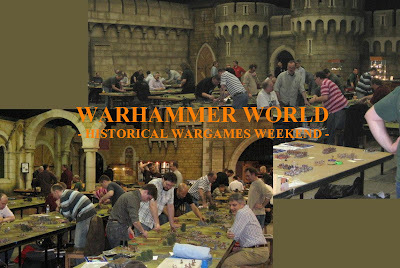 The Warmaster enthusiasts have given Society of Ancients events a lot of support of late - the BattleDay, the AGM - and the game is giving an extra dynamic to these events. So, a lot going on up here, and a very warm welcome for us. Sadly, I wasn't able to take up the offer of getting more involved this year (there was the Fiasco show to go to on Sunday in Leeds ...)... but I'm quite tempted to book in for one of these events and get some playing time in! 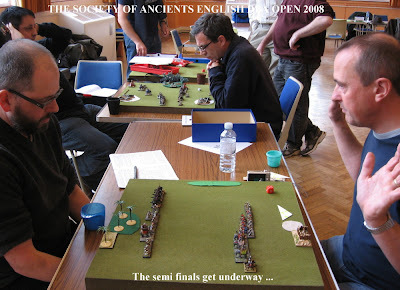 Organised by PAWS, the Society of Ancients, Magister Militum and sponsor the annual English DBA Open. Representing SoA, I went down to help Phil Barker present the prizes. I organised my weekend well enough to stay for the day and get some games in, too. Mind you, compared to the team visiting from Italy, mine was a fairly modest expedition. Ciao, guys .... For an Italian view of the event, you could try (here ....). As well as a juniors section and a 25mm section, there were 24 players contesting the 15mm senior trophy. We played off in 4 pools of six players - so generating a 'round robin' of 5 games each ... before the top player from each pool went into a semi-final and final knock out phase. The games were scored on a 5-2-1-0 basis, the 5 being for a proper decisive game win within the time limit (anything else gaining the player 2, 1 or 0) ... so no question - the emphasis was on getting to grips and beating the enemy. 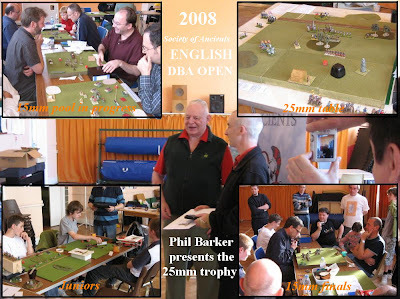 After a refresher course (and defeat) very gamely offered by Richard Pulley, my second game was against Mr DBA himself, Phil Barker. No time pressure needed here, it turned out. Phil's army of over-eager Huns (they were being keen enough to ravage their way to the Horn of Africa!) 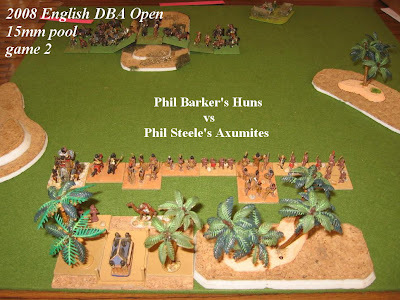 deployed in a tight box ready to burst and overwhelm my sturdy Axumites ... however the 'Pips god' (if indeed it was not he whom I was playing!...) enabled the African warriors to close the ground rapidly (the power of the Ark of the Covenant or some such mumbo-jumbo ...). 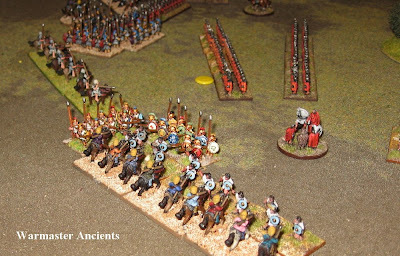 With one or two 'favourable' combats (mounted v Ps, mounted v Bw, skirmisher v elephant) and precious few Pips to do otherwise, Phil (unwisely, it would turn out) chose to bring about a general and mostly frontal engagement. He failed to win the 'quick kill' combats, and got stuck far to tight with the supporting combats against the warband. The Axumite riposte cut them to pieces. It was the dices, of course (and the clock ... and an opponent who knew well enough that evasion was his strength, but who wanted to gamble for a decisive win ...) ... but it prompted a run of Axumite luck that saw me through the remaining three games undefeated. Thanks Phil. I had managed to call in on the event last year, so determined to participate this year. It was a lot of fun. 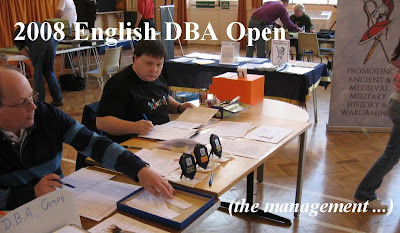 I have been in or around DBA since before it existed in its current format (I co-organised the Society of Ancients Conference for which Phil conceived the original quick, 12 element, game DBSA ... ), but have become pretty jaded with the DB system, particularly in its 3.1 version of DBM. Indeed, I don't think that game really works any more. So it was good to get back to basics, and to the version of the game not weighed down with grading factors, Pip swapping generals, fiendishly complicated spontaneous moves and bogus press forwards. And, frankly, to a version of the game where it doesn't take 31/2 hours to end up with a draw! 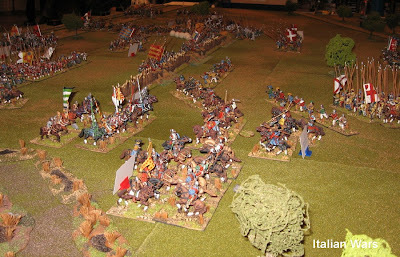 In this game, cavalry armies are popular but infantry armies still work; there is no artificial imbalance imposed by regular/irregular; warband and similar 'quick kills' make reasonable sense in the context of the game - and the Pips system does seem to add to, rather than frustrate, the games intention of simulating ancient battle. In hindsight, it seems disappointing that the 'big ancients game' ended up following the DBM rather than Big Battle DBA route. My choice of Axumite Abyssinian served me well enough. 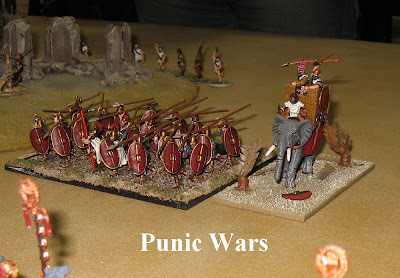 It's half Warband - but the option of the Elephant general, plus a Psiloi, 2 Bow, a Blade and a LH gives it some flexibility and some punch against horsemen. I decided to use it in order to get out what is effectively a retired DBM army ... it became almost unusable with what 3.1 did to (F) troops, especially Warband ... and is currently not even on the schedule as far as FoG lists are concerned. 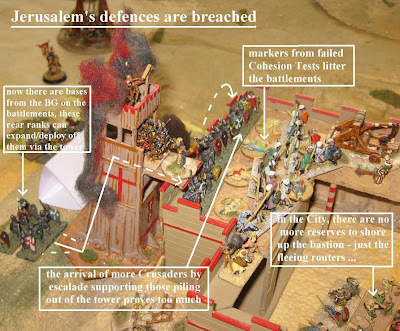 All that aside, the Axumites are a great example of what historical wargames can do. I was introduced to these African armies by the series of articles Richard Young wrote for Slingshot. Those, and an awareness of the mythology of the Ark of the Covenant ending up in Ethiopia ... Our shared leisure interest has a unique way of blending an enthusiasm for collecting new toys and playing games with a fascination with military history - especially those intriguing bits that usually get left out. And so I found out more about the powerful Christian Kingdom of the Horn of Africa, its impressive material culture, its alliances with Constantinople and wars across the Red Sea against the Arabs and Sassanids. Of course, we all like to take some liberties ... aside from the story of the Ark of the Covenant, the Ethiopian kingdom may also have a biblical connection to the lands of Sheba. The Sabean culture most obviously associated with of Solomon's royal visitor existed on both sides of the Red Sea, and Egyptian records of the land of Punt indicate African realms with female leaders - was the real Queen of Sheba one such? Would she have been Arab, Yemeni, Axumite? Well, in wargames terms, her army would most likely have been Saba* - and the Queen of Sheba certainly predates the given dates for the Axumites by over 500 years. Did that stop me constructing the army around an Ark of the Covenant in the camp and an Elephant General which just happened to be ridden by a female leader? Well, given the dates, it obviously would have been a queen of Sheba, not the queen of Sheba - and a nod to an engaging tradition. Any excuse. A scantily-clad Queen of Sheba riding an elephant? That's what I meant by Mumbo-Jumbo! * ... anyway Saba have no Elephants ... in fact nothing interesting for a queen to ride at all - why, even Arab tradition shows her riding a camel! The first decision that has been made has been to define 2" as the MU (effectively doubling all the distances). This is because everything in FoG happens (broadly) within 15 MUs - mostly the last 6 or 7 - so a game using a 1" MU is needlessly confined to a narrow band of the playing area. I made up some additional personality figures ... Here is the governor of Jerusalem, Iftikhar ad-Duala ... 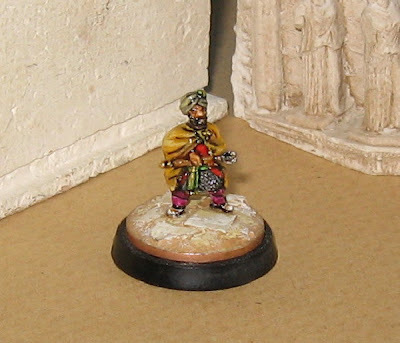 He can be a Troop Commander (he will be useful within 4 MUs/8", but can't be everywhere at once). The general aim, of course, is to get something with a plausible feel and look - but which allows us to use the game mechanisms to play out the historical events. Treat the siege engine as a transport or capability marker. Stack the figures, commanders etc. that represent the BG up behind it. Use it for the movement and combat position. A shooting gallery or belfry is a stand's worth of shooting (the tower might have more than one), the draw bridge is a stands worth of combat frontage. The Tower makes its final move into contact in the impact phase, and fights one stand (against a single enemy stand). 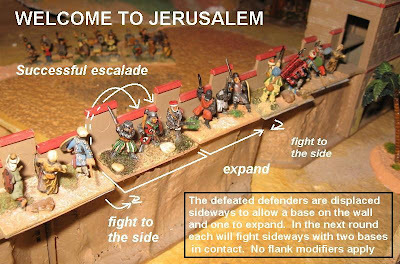 If the attackers win the combat, the attackers must make room for the fighting stand to be placed on the rampart, and an expansion from this is allowed in the movement phase (again, the defender must displace figures to permit this): pick stands up from the stack behind the engine, and place them in the developed combat position. Where wall walks only allow a single stand's depth, it is sensible to use the same system, but count side to side contact as it front to front. Again, if the attacker wins, an expansion must be made room for by the defender (this way, the assault parties can push their way out from a successful attack). If they assaulters fail to win, they are not established on the wall. The defender can overlap them - they cannot expand or count as more than the single base. If they break, they rout away from engine/equipment at ground level. The defenders can pursue them - but are not obliged to (no test required). Any bases from either side that are not counted as fighters in the melee can be shot at in the usual way. Equipment - from ladders to siege towers - 'belong' to BGs. They can be parted in two ways. If the assault party is successful, the equipment can be left at the walls and the BG press on. If the enemy make unopposed contact with any such equipment that has no friends on it/in it/defending it, it is lost. Otherwise other BGs can make temporary use of it to enter the fortress etc. (apply some common sense and be prepared to put scenario notes in should there likely be complicated interactions). If the BG assaults but is routed, likewise it loses the equipment (normally, this means the equipment is destroyed, but scenario notes are useful ..).. Here a BG approaches the walls with a Cat or Shed .. The whole BG .. 4 stands, the Cat and an attached commander have been placed on a movement tray. It helps the player treat it as an entity (and makes movement easy!) .. it is a BG, formed for an assault. It counts as 4 stands, it has a singles frontage ... it has a Cat with a ram and there is a commander present.